Depending on factors like whether their employees are attempting to lose weight or quit smoking, employers could vary their workers' health care premiums by as much as 50 percent of the cost of coverage, under an amendment passed to health care reform by a Senate panel Wednesday night. The Senate Finance Committee voted Wednesday to approve an amendment that would provide a financial incentive for people to change unhealthy behaviors, Politico first reported. The amendment was sponsored by Sen. John Ensign (R-Nev.) and Sen. Tom Carper (D-Del.). It passed by a vote of 19 to four, committee staff said. "Weight gain and unhealthy lifestyles that focus on smoking and lack of exercise have sky-rocketed our health care costs," Ensign said in a statement. "These costs could be lowered by focusing on what makes us healthy - through weight loss programs, smoking cessation and preventive care." Under current federal regulation, beneficiaries can receive financial rewards for achieving certain health goals, but premiums can only vary by 20 percent of the total cost of employee coverage. The amendment approved Wednesday would increase that amount to as high as 50 percent and also provide waivers to beneficiaries who cannot meet certain health goals because of medical conditions. However, Politico reports opponents of the amendment, like the American Cancer Society, sent the committee a letter saying it would allow insurers to continue to use discriminatory practices and make coverage decisions based on pre-existing conditions. 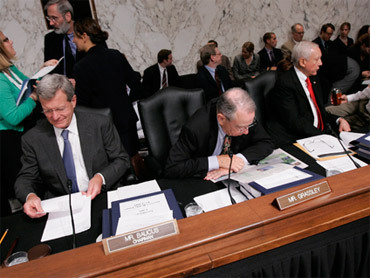 Finance Committee Chair Max Baucus (D-Mont.) reportedly said the amendment could result in higher premiums for those who do not sign up for wellness programs. He was not, however, among the four Democrats who voted against the amendment. Democrats Jay Rockefeller (W.V. ), Chuck Schumer (N.Y.), Robert Menendez (N.J.) and Bill Nelson (Fla.) voted against it, according to committee staff. At least one lawmaker has previously voiced concern that consumer protections in the Senate Finance bill, such as barring insurance companies from denying coverage because of pre-existing conditions, are not strong enough. Rockefeller has said that the insurance reforms in the bill should be extended beyond the individual and small group (companies with a limited number of employees) markets. He says they should be extended to employer-based plans in what is called the "self-insured" market. "I want to make very clear that we cannot promise the American people that the insurance reforms they have been hearing so much about will benefit everyone, when the reality is that this bill leaves out 46 percent of the American people," Rockefeller said when the Finance bill was introduced. "Insurance reforms should protect everyone – including people in the self-insured market."